Every Mac has at least one account that allows you to use your computer. However, if multiple people need to use your Mac, you probably don’t want to share the same account, which can be like trying to share the same pair of pants. Administrator: Gives the user access to create, modify, and delete accounts. Typically, you have only one Administrator account; however, another user you trust implicitly, such as your partner, spouse, or job-share colleague may also have an Administrator account. Standard: Gives the user access to the computer and allows them to install programs or change their account settings, but doesn’t let the user create, modify, or delete accounts or change any locked System Preferences settings. Managed with Parental Controls: Gives the user restricted access to the computer based on the Parental Controls defined by an Administrator account. Sharing Only: Gives the user remote access to shared files but not the access to log in or change settings on your computer. Although each set of instructions begins with opening System Preferences and ends with closing System Preferences, you can open it once, go through each of the following sets of instructions, and then close System Preferences at the end. Choose Command→System Preferences and click the Users & Groups icon Users & Groups preferences pane (see the figure). Click the Add (+) button in the lower-left corner (above the lock icon). A New Account dialog appears. Choose the type of account you want to set up from the New Account pop-up menu, as shown in this figure. Enter the name of the person who’ll be using the account into the Full Name text box. (Optional) In the Account Name text box, edit the short name that your Mac automatically creates. Enter a password for this account into the Password text box. If you click the key to the right of the password text box, your Mac will generate a random password that may be more difficult to guess but also harder to remember. Re-enter the password you chose in Step 6 in the Verify text box. (Optional) In the Password Hint text box, enter a descriptive phrase to help remind you of your password. The Users & Groups preferences pane displays the name of your new account. a.Click the image (the Picture well) above the name to reveal a selection of images you can assign to that user. b.Click an image from the Defaults that are shown, click iCloud to choose a photo from Photo Stream, or click Camera to take a photo. c.Click Edit to zoom or add a special effect to the image or photo. d.When you have a photo you like, click the Done button to assign the photo to the user. Click the Set button next to Apple ID to associate the correct Apple ID with this user. The button will read Change if an existing Apple ID is already assigned. 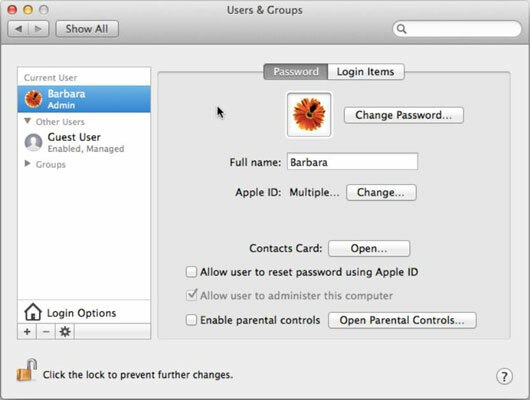 Allow User to Reset Password Using Apple ID: The user can go into the User & Groups panel on his Mac to set up and change the user password by identifying himself with his Apple ID. Allow User to Administer This Computer: Change the account type to Administrator. Enable Parental Controls: Click the Open Parental Controls button to assign the limits you want to apply to this user. Click the lock at the bottom of the window to prevent changes. Click the Close button of the Users & Groups preferences window.